by [Bible] RAMPEGOLLO, Antonio de [Antonius de Rampegollis [or] Anthonium de Rampegolis]. Argentine [i.e. Strasbourg]:: Joannem Knoblouch, ., 1516. Small 8vo. Collation: AA12, BB8, A-Z8, Aa-Jj8. Foliation: , cclvi ff. Title printed in red and black, large woodcut title vignette of the virgin Mary holding the baby Jesus at her breast surrounded by four angels, 3 small woodcuts, woodcut initial letter. Original full blind-stamped calf, raised bands, two later black leather gilt-stamped labels; rebacked mounting earlier labels, seemingly preserving originally used manuscript [ca. 15th century or earlier] sheets used as pastedowns, manuscript title[?] applied to bottom edge [near spine]. Bound very tightly. Manuscript inscriptions on title obscured with ink. Fine. Early sixteenth century edition of this text from the theologian Antonio Rampegollo printed in Strasbourg by Johannes Knobloch I (d.1528). Knobloch started printing as early as 1497 and was responsible for much of the printing and publishing in this town for the rest of his life, then his son Johannes Knobloch II, continued the business. The text for this edition was previously printed in Cologne by Cornelius von Zierickzee [1505 and 1511]. Perhaps it is significant to point out that the German Reformation, initiated by Martin Luther, began with his Ninety-five Theses issued in 1517, just after this work being printed. "De Diablo": The extensive section [ff.69-78] on the devil discusses his place in the Bible, exorcism, and witchcraft. Thus the title suggests "Figures of the Bible" it really means Biblical theology or themes. 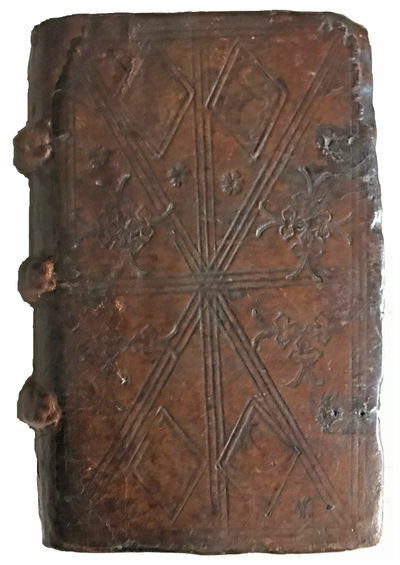 The book contents (as taken from the "index") includes: Abstinentia [abstinence], Accidia [apathy], De Adulatione [flattery], Amicitia [friendship], the Apostles, Ascencio [Ascension], Avaricia [greed], De Beacitudine [Blessed, happiness], De Charitate [charity], Confessio [confessions], Conscientia [awareness/conscience], Compunctio [compunction], Detractio [Detraction], Diabolous [diabolical], Divitie, Ecclesia [Church], Elemosyna, Fides Christinana [Christian faith], Bratia, Bula, De Humana conditione [human condition], Humilitate [humility], Infernus [Inferno/Grave], Justicia, Lachryma [crying], Luxuria [self-indulgence - desire - lust], Maria virgo [Virgin Mary], Misericordia [compassion], Mundus [world], Oratio, Passio Christi [Passion of Christ], Patientia [patience], De Parentibus [parents], de Paupertate [of poverty], Penitetia [patience], Perseveratia, Predicatio, Recidivum, Religio, Resurrectio [resurrection], Sacerdos [priest], Scriptura sacra [Sacraments], Superbia [pride], Temptatio [Temptations], etc. Antonio Rampegollo (Antonius de Rampegolis, Antonius Rampegola) (sec. 14.-15. ), Augustinian theologian and Genoese orator, intervened at the Council of Constance in 1414.